This is not your average shrimp! Found in the Pacific, from Southern California all the way up to Alaska, as well as Japan and Korea, these beauties, identified by the white spots on the sides of their first and fifth abdominal segments, live up to 11 years. And here’s the crazy part: each spot prawn (or spot shrimp) spawns once as a male and one or more time as a female! Having read so much about them, I ordered a pound and decided that I would get full use of the shrimp by peeling them and making an intensely flavored sauce out of the shells. Peeling and de-veining was easy: the shells slipped right off the shrimp, and they were so beautifully clean, their were no veins to remove! If you can’t get hold of Wild Pacific spot prawns, shrimp or lobster will certainly do. 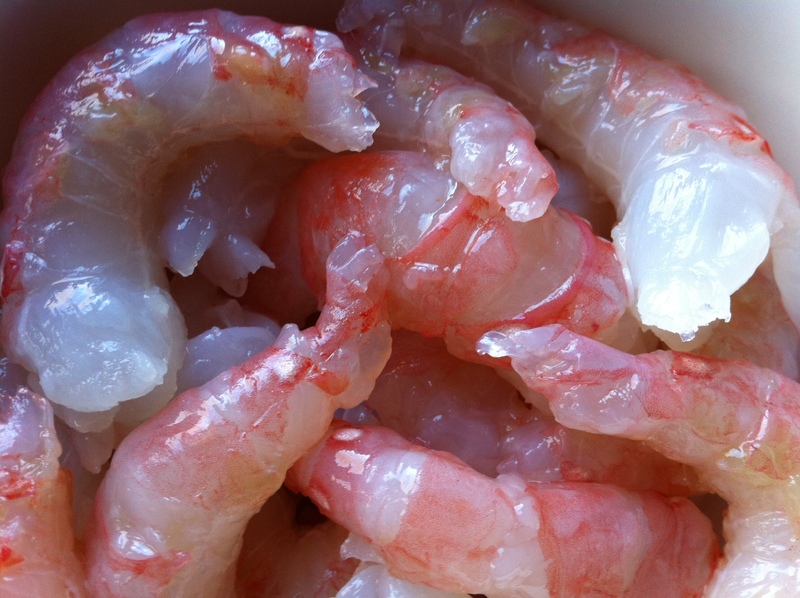 Just remember to ask your fishmonger for wild caught American shrimp, and not that horrible farmed stuff from Asia. If he doesn’t have it, shop elsewhere. 1 lb. 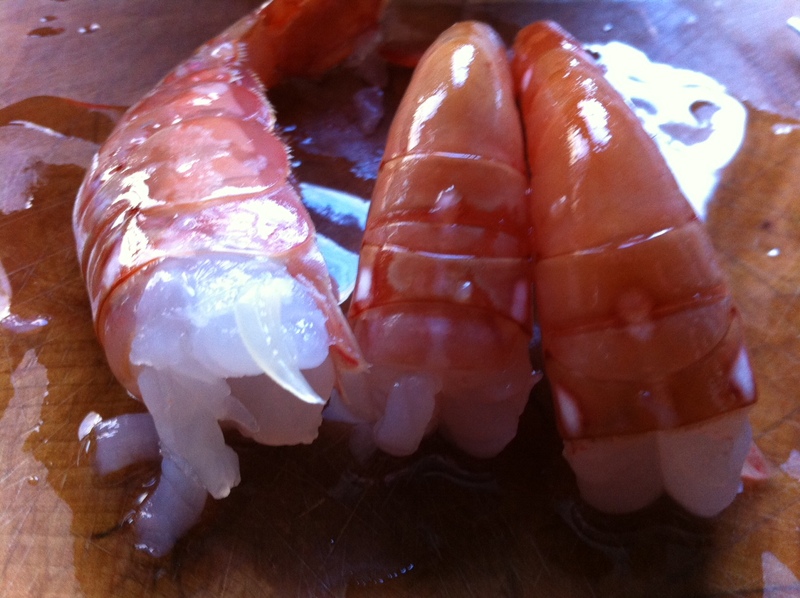 wild Pacific spot prawns, thawed, peeled, and de-veined. Save shells and container water, if any. Peel and de-vein the shrimp. Keep the peeled shrimp in the fridge, covered. In a pot, heat the olive oil and add the carrot, celery, onion, garlic, peppercorns, ketchup, rosemary, thyme and shrimp shells. Saute for a few minutes to get the flavors going. Add the container water, if any, and 6 cups water. Bring it to a boil and let it simmer for 2 hours. Strain the solids out and discard them. Place the stock in a smaller pot, and continue reducing it until about 1 cup of the stock remains. 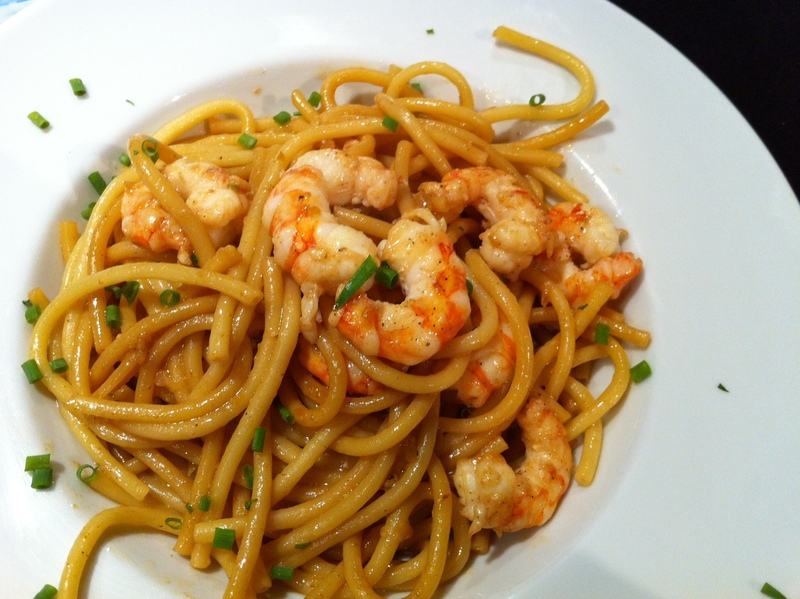 Boil the pasta well-salted water and remove it from the water before al dente stage. (It will cook more later.) Strain it and set aside. Combine the salt, pepper and sugar with the prawns in a bowl and toss to coat them evenly. In a large saute pan, heat the butter and olive oil on medium-high heat. Add the shrimp and cook until lightly caramelized and almost cooked all the way through. Do not overcook! Set them aside. In the same large saute pan that you cooked the shrimp, heat 1 tablespoon of olive oil and add the shallot. Saute for 1 minute, then add the garlic. Saute for 2 more minutes, then add some of the stock, the shrimp, the pasta, and the butter, and mix well. If it’s dry, add more of the stock until the pasta is coated, but not dripping. Salt and pepper to taste. Garnish with the chives.